Welcome to Friday Feast, where food and fiction unites in one mouth-watering place! And we’re going to be getting very mouth-watery soon with a Feast first-timer. But I’m sure you’re anxious for the latest instalment of Us Heins Weren’t Meant To Play Golf, and I wouldn’t want to deprive you. Last week I only lost one ball to a dam. A miracle! Next week I’m aiming for none. Can such a feat be achieved? Stay tuned! Now on to my guest, a man set to break Feasty tradition. No, not because he’s a he – although this is unusual – but because he’s… American. Yes, today’s guest, J.M. Bray hails from Southern California. I know, I know. Friday Feast is usually restricted to my enormously talented and glamorous Australian compatriots, but J.M. asked nicely if he could and I said yes. ‘Tis good to have variety, plus J.M. is a member of the Romance Writers of Australia and is published by Australian publisher Escape. And he plays guitar and races a Porche, which, let’s face it, sounds pretty damn cool, so I think we can kind of claim him for today. J.M.’s debut release is a new adult romantic fantasy novel called Tearing The Shroud and it looks a brilliant read. Take a peek. Fall in love, be possessed, hunt a sorcerer and save the world — and Vincent thought calculus was tough. 1984 — Vincent expected college to be about freedom and girls, but then the nightmares of sorcery, monsters and other worlds began. Not even the surprising attention from his dream girl, Julie, could shake them. Before he’s even nailed his second date with Julie, he’s possessed by Coleman, a warrior from another realm. Coleman is hell bent on defeating the monstrous Kafla who threatens to tear into Vincent’s reality, changing both his and Coleman’s worlds forever. They have one chance to stop them: Vincent must allow Coleman to share his body and wage war against the sorcerer. Now it’s up to them, the women they love, and Vincent’s rag-tag bunch of role- playing and gaming friends to save the world, or see 1984 descend into the apocalypse. See? Told you it sounded fantastic. It’s available now for immediate download to your e-reader, tablet, computer and phone. Buy from Amazon, iTunes, Barnes & Noble, Kobo, BigW ebooks, Google Play and JB Hi-Fi, or your favourite ebook retailer. Loaded up? Excellent. Now enjoy this man-in-the-kitchen moment! The earliest memory I have of a cooking is being on a stool next to my grandmother. We lived in a small house behind her home and every morning until I was five, I’d toddle down to her back porch where she waited for me. I can still here her say, “Come on, honey, help grandma cook.” Her heavy, white porcelain, gas stove with cast iron skillets and big pots bubbled and sizzled magically. I would watch as she fried bacon, then used the dripping to fry eggs, the centers soft and the edges a crispy dark brown from the bacon fat. 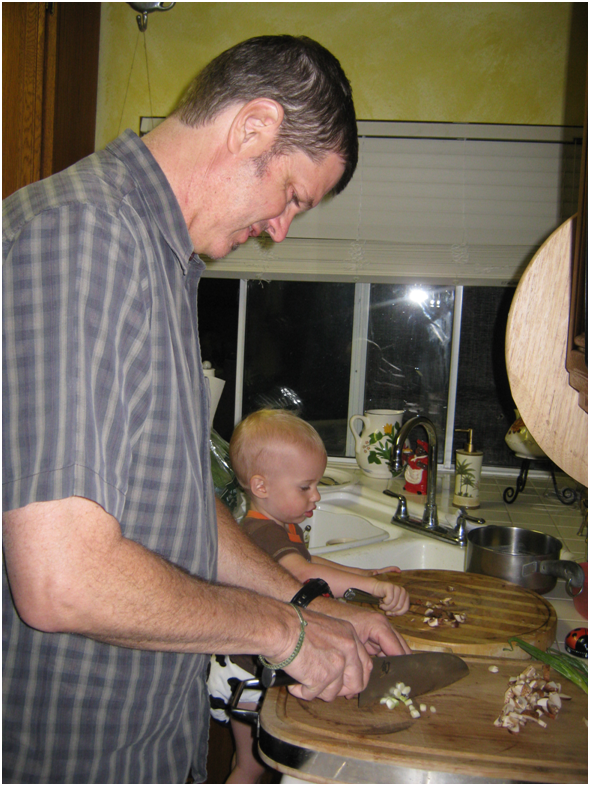 My very first experience as a “cook” was near that time, stirring the white, sausage gravy. Yes, sausage, bacon, fried potatoes, eggs, fluffy biscuits (scones), coffee and juice was the normal breakfast. She was from the south, of Irish descent, born in 1898, five foot two inches tall and not a thin woman…which isn’t surprising given the food she made. Based on the time frame, I was about four. I’d stir the white gravy, with a spiraled whisk, careful to keep it from sticking as it thickened to a creamy consistency, later to be slathered over buttered biscuits. Through years, she taught me how to bake bread (which she did twice a week until her death at age 81,) flip eggs without breaking them, make gravy and cook my favorite…potato soup. I once ate so much of it as a young teen that when I tried to stand afterward, I ended up on the kitchen floor. I learned my love for cooking at her side. 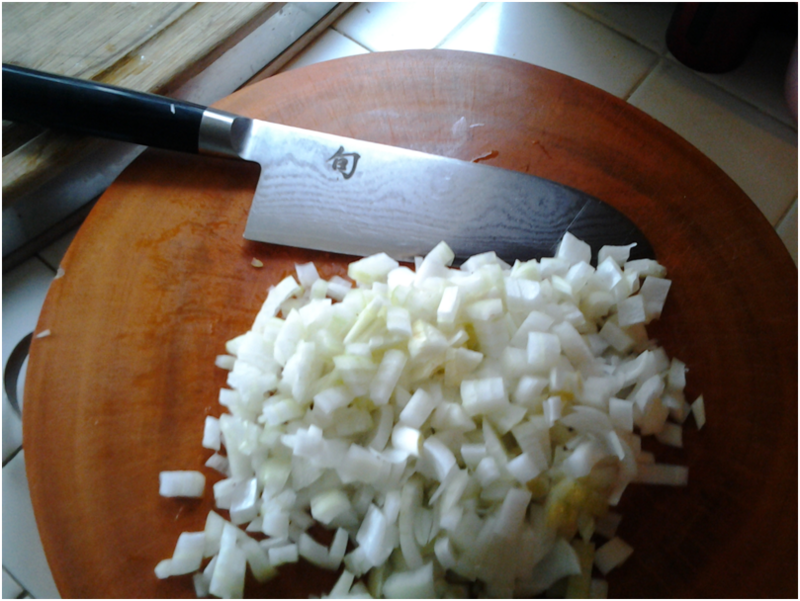 I am the cook in our family and every time I lift a ladle or toss a spice in without measuring it, she is with me. 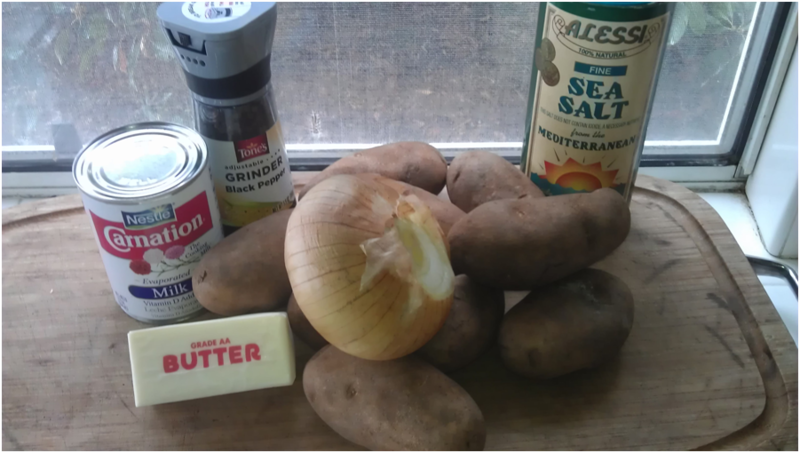 Today’s recipe is of that same soup…though I’ve made a slight improvement on her recipe. I think she’d approve. This soup, made by my protagonist for his girlfriend and her family, appears in Mending the Shroud, book two of the Shroud Trilogy. It will release mid-year through Escape Publishing. Consider this a preview. In the Comments section post a fond memory of you have of a family recipe or cooking with grandma. We’ll roll the dice among the entrants and the winner will receive an ebook (.mobi or .epub) of my romantic fantasy novel, Tearing the Shroud. Serves 6-8 as a full meal. Chop the onions and put them in a large pot with the stick of butter on a low-medium heat to cook until transparent or slightly golden. 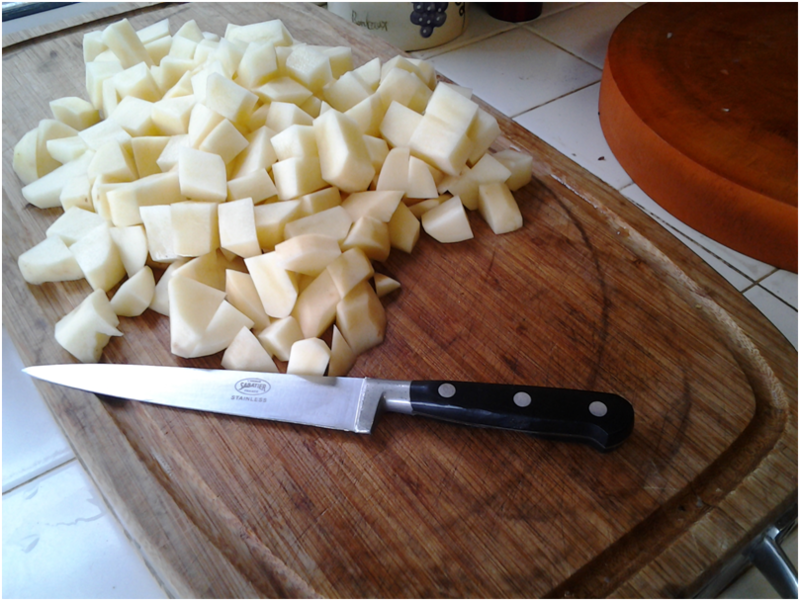 While that’s cooking, peel the potatoes and cube them to about 3/4 inch. 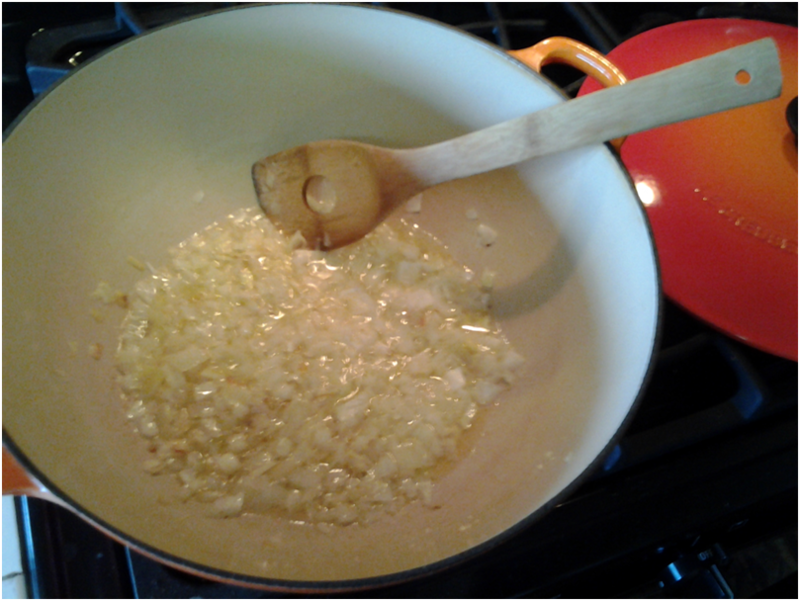 When the onions are ready add the potatoes to the pot and stir carefully, coating them with the onion butter mixture. Add just enough water to come ¾ of the way up the potatoes. 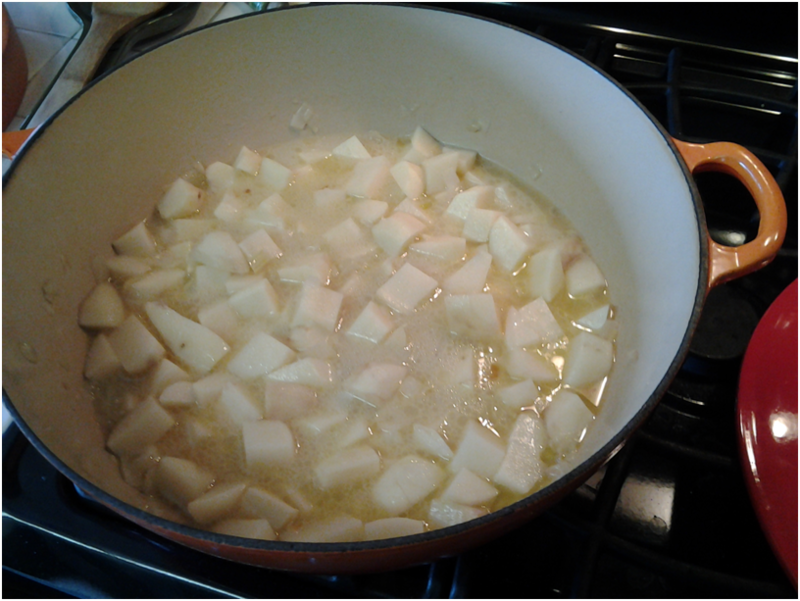 Bring to a light boil, cover and let cook until the potatoes break apart when poked with a fork. Check occasionally to make sure you don’t run out of water. 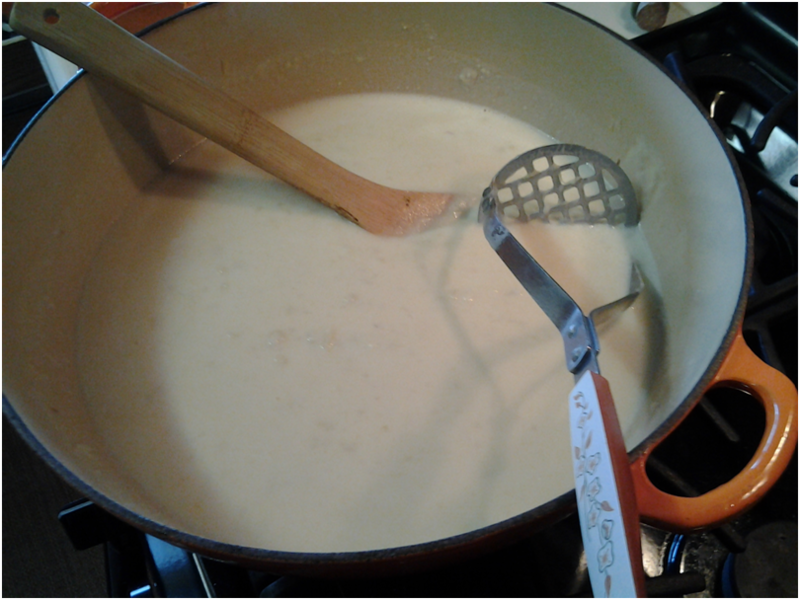 Add the can of milk and mash with a hand potato masher…DO NOT MIX with a mixer or immersion blender. It breaks up the potato too much and makes it too starchy. You want the soup to have texture with little pieces of potato. If you need to thin the soup, use milk or half and half, not water. Salt and pepper to taste. It takes much more salt than you’d think, so don’t be shy. As you can see, this is not a health conscious recipe, but is it ever good! It is, however economical. For less than five dollars, you can serve a hearty meal for 6-8 people. This soup also works wonderfully as a starter for large dinners or banquets. When I’ve done this, I just multiply the ingredients for my crowd and garnish with a sprinkle of chopped chives just before bringing to the table. I think we will enjoy, J.M. What a handy recipe. With that creamy, buttery spudly goodness I’m thinking it’ll taste awesome too. So Feasters, we have another giveaway! Share a fond memory of cooking with your grandma or a treasured family recipe and you’ll go into the draw to win an e-book copy of J.M.’s fab novel, Tearing The Shroud. I have lots of wonderful memories of cooking with my Nanny. Mum used to go off to netball on Saturdays and I would spend the afternoon with my grandparents. During those hours Nanny taught me to bake and sew and do all sorts of house-wifely things. They were lovely times that I’ll always treasure. What about you? Any sweet memories you can make us dewy-eyed with? Giveaway closes midnight Tuesday AEST, 4th March 2014. Open internationally. Rah! If you’d like to learn more about J.M. and his books, please visit his website. You can also connect via Twitter, Facebook and Pinterest, and also through his blog. This entry was posted in Friday Feast and tagged Barnes and Noble, BigW ebooks, book giveaway, Cathryn Hein, Cooking, ebooks, Escape Publishing, family recipes, Food, Friday Feast, giveaways, Google Play, heirloom recipes, iTunes, J.M. Bray, JB Hi-Fi, Kindle, Kobo, Mending the Shroud, potato recipes, potato soup, promo, Recipes, Romance Writers of Australia, romantic fantasy, Tearing the Shroud, Tearing the Shroud by J.M. Bray, Young adult novels on February 28, 2014 by cathrynhein.